Is this the only dental implant procedure you perform? Will I need a bone graft? Do I need to keep my dentures? Is implant surgery painful? How long will the whole procedure take? Is there a risk of failure? Why doesn’t every dental clinic offer the Four-under-One? What can I eat after my surgery? No. At Dentistry Plus we offer several solutions, depending on your requirements and budget. 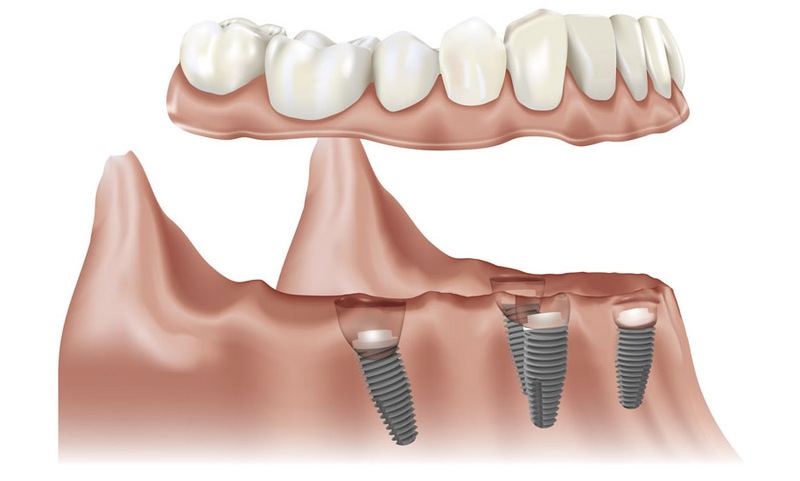 The Four-under-One (Full Arch Rehab on Four Dental Implants) is a permanent solution that provides maximum stability. However, the costs are more than other solutions we offer, such as the Dentures Connect Plus system. One of the advantages of the Four-under-One is that those with compromised jawbone levels can still go ahead with the procedure. However, there is a certain baseline required. Your dentist will discuss this with you and take x-rays to confirm your eligibility for the procedure. The x-rays will evaluate your bone volume, density and quantity. Sometimes, you can avoid a bone graft, instead choosing to have longer implants anchored into the cheekbone, known as zygomatic implants. No, you will no longer need your dentures. The Four-under-One (on 4 Dental Implants) is a permanent solution. Upon completion of your procedure, you will have a set of non-removable, natural-looking replacement teeth. These permanent teeth will stay in your mouth forever. Many people have asked whether dental implant surgery is painful, so we’ve written a blog post on the subject here. The Four-under-One procedure is very quick. You will have your implants fitted and your permanent bridge attached within two days. As with any surgical procedure, there is always a risk of failure. However, implant surgery has a high success rate. Also, certain contributing factors lend themselves to the success of the procedure.These factors include the experience of the surgeon (Dentistry Plus has a highly experienced implant specialist working in-house), infection control (infection control standards in Australia are exceedingly high) and careful examination of the patient’s general health, medical history and pathology prior to commencing the surgery. The Four-under-One Full Arch Rehab is a sophisticated technique that requires a dedicated dentist with an advanced skill set, experience and expertise. At Dentistry Plus, we have a dedicated in-house dentist that is highly skilled in this technique. For the next 6 to 12 weeks after your surgery, only soft food is recommended. Your dentist will discuss your diet with you and give you diet plans and suggestions to follow.